We hope you’re enjoying The Sims 4 Get to Work* Expansion Pack, whether your Sim is saving lives as a Doctor, solving crimes as a Detective, creating wondrous inventions as a Scientist, or developing their very own retail business. Keep the stories and photos coming! 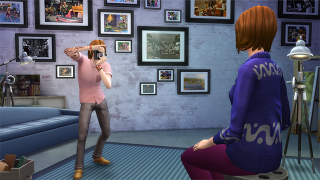 Speaking of photos… we thought we’d dive a little deeper into the new Photography Skill in the expansion pack and give you some tips for capturing all the memories your Sims are creating. Start with selfies. Every selfie your Sim takes improves their Photography Skill, so go crazy! From gym selfies to fashion selfies to moments captured on the job, your Sim can document… well… themselves, whenever they want. It’s a great way to improve their skill, and lets you capture their every move with snazzy pics. Take advantage of all your cell phone can do. While selfies are a great way to remember moments that take place three feet from your Sim’s face, they’re not the only cell phone picture your Sim can take. Taking photos on the phone is super easy for your Sim – under the Entertainment section, there are options to take photos of objects, other Sims, or a selfie with another Sim. Hone your skills. Don’t get discouraged if your Sim’s first few photographs seem blurry. Photography has five levels and the more photos your Sim takes, the more their skill level will rise, reducing the number of blurry, ruined photographs. Pick up a better camera. Any Sim can take pictures using their cell phone, but if you really want to dig into the Photography Skill you’re going to want something with more power. Your Sim can select a camera from three options in build mode based on cost and features. Certain cameras have increased options such as zoom and varying sizes. Learn the features of the tricked out cameras. Once your Sim takes out their camera, they can make fine adjustments to each shot, such as adjusting camera view (rotation/pitch), zoom, size and aspect, applying filters, and turning the flash on/off. Some of these options are only available on fancier cameras, so have your Sim save those Simoleons if they want all the bells and whistles. Attach more emotion to your photographs. 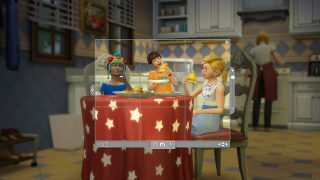 After your Sim takes a photograph, it can be converted to a Memory using the option “Add to Memories” on the photo. Sims that appear in each photo can be tagged and an emotion can also be associated to the photos. Whenever your Sim looks at these photos, they’ll feel the emotion associated with the memory, adding even more emotional depth to your decorations. Hang your pictures on your walls. Taking photographs is only half the fun! What makes them really special is what you’re able to do with them. Now your Sim can decorate their home with the photos they’ve taken by dragging them from the Inventory straight to their walls! Pop art, collages, landscapes or abstracts… whichever style suits your Sim, they can display their photos in their homes. Set up a Photo Studio. Those pictures you can hang on your walls? If you hang them on the walls of a Retail lot, your Sim can sell them, too! Why not make a full-blown Photo Studio using the new Photo Studio object? Sims can pose in front of it solo or with another Sim, and the backdrop can be changed and customized to set the mood. Haven’t picked up the expansion pack yet? Read about 8 Things You Can Do in The Sims 4 Get to Work, or find out what it’s like to play A Day in the Life of a Doctor.